What’s happening in kitchens in 2017? I asked myself this question recently and was delighted to find an article in House Beautiful (http://www.housebeautiful.co.uk/decorate/kitchen/news/a1170/kitchen-trends-2017/) that answered the question perfectly and even better, we can help you achieve this year’s trends for kitchens! 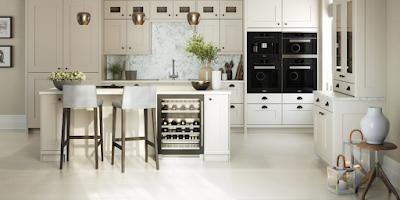 The first thing we’ll be seeing in the trend setting kitchens this year is Quartz. 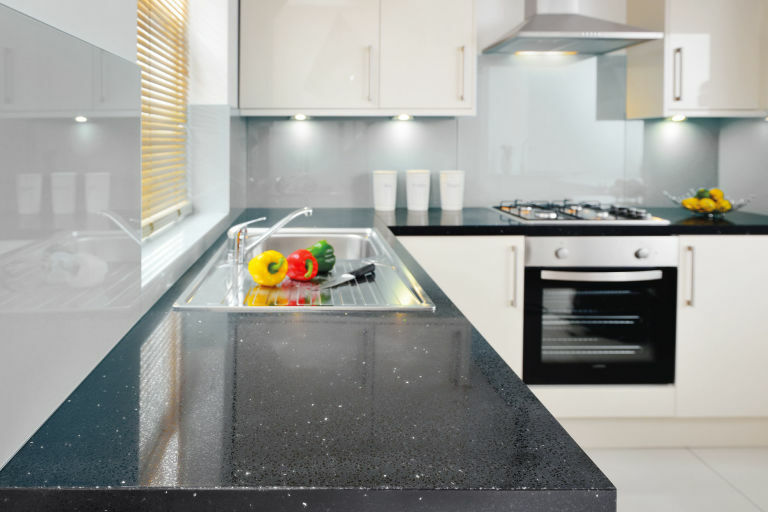 We love quartz worktops at DWS. Who doesn’t love a bit of sparkle?! If that really isn’t your thing we do a gorgeous concrete range in our quartz worktops which fulfils the second top trend in kitchens…industrial design. I have to say that Scandi styling is still my first love but I am definitely drooling over Pinterest pictures of the industrial look lately. Believe it or not my local Tesco cafe has pulled this look off quite well with exposed brick, exposed pipes, rustic metals and minimalist furniture, the trend is inspired by factory spaces and is actually very popular in Scandinavian countries, which may explain my liking towards it too! Quartz gives any kitchen a luxury feel while being total hygienic thanks to the non porous nature of the material. It’s previously thought to have a luxury price tag too but at DWS you will find up to 50% reductions on the High Street prices. Trends three and four are leaning towards minimalism, with handleless units and clutter free worktops. The first thing that comes to mind for me in kitchens with these features is Corian. There’s nothing more sleek, minimalist and fuss-free than a beautiful Corian work surface. This material suits traditional kitchens too but it is the perfect choice for contemporary designs. 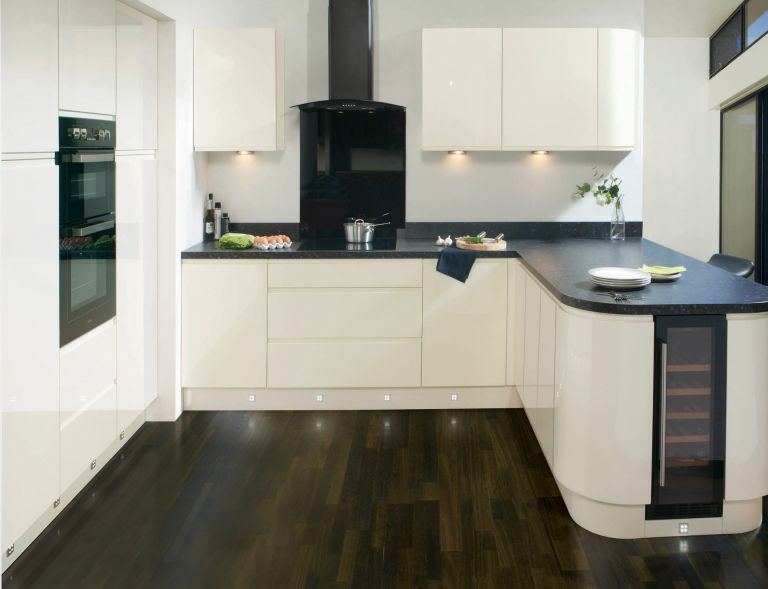 Because of the seamless joins there’s no better surface to compliment handleless doors and clear surfaces. 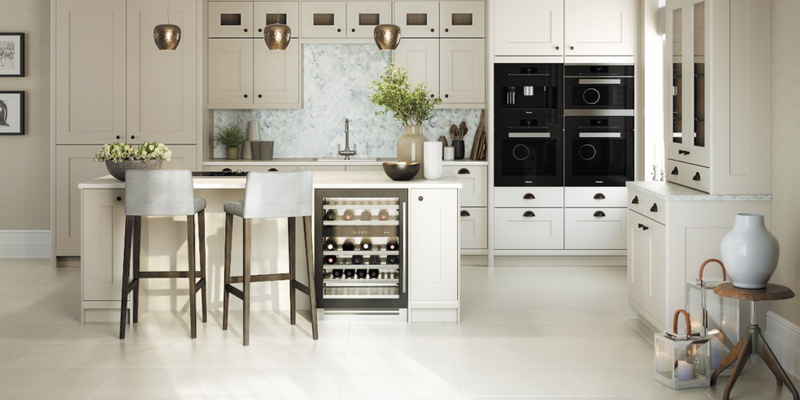 The last trend for 2017, that we could help you achieve in your kitchen is monochrome tones. Black, white & greys have always been best sellers for DWS as they go with any decor and so we have a wide range of stunning worktops in these hues, in various materials. Email info@dws-uk.com to find out more about any of the worktops mentioned and to get a competitive quote from our experienced sales team. Happy New Year to all of our customers. 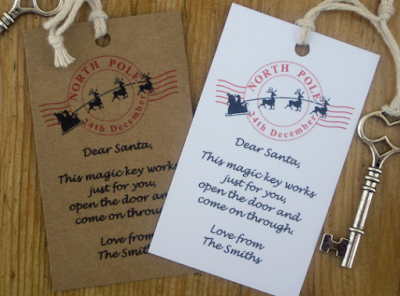 We trust you enjoyed the festivities and are now looking forward to the coming year. We've got off to a very busy start to the new year here at DWS. I can't believe we're already into February…time is flying by!! As we approach the promise of lighter nights you may be thinking of Spring projects to revamp your home If you’re looking for fresh new kitchen worktops, bespoke or ‘off the shelf’ then call or email with your kitchen dimensions and we’ll help you to get your home resolutions underway. We plan this year to continue to bring you great quality products at very competitive prices and we're hoping to add new products to the website as well as a 'cart' feature to make the buying process quicker and easier for ready made worktops. 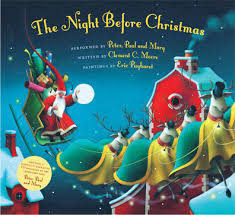 a Christmas themed book - I particularly like the idea of 'The Night before Christmas' as I loved this poem as a child. 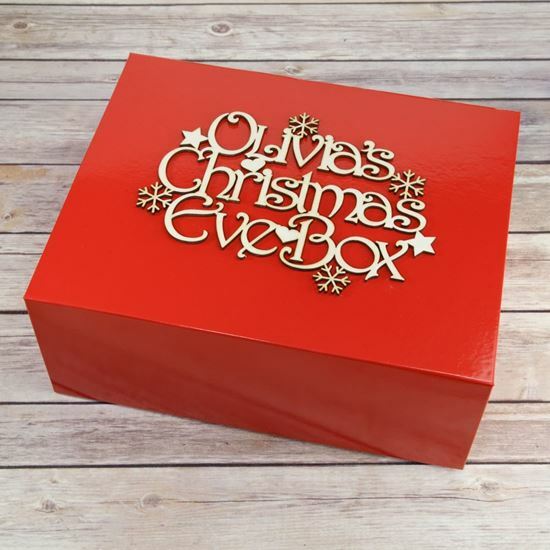 This is just an example of the many items that could be put in to the box, creating a lovely family tradition that children would love. 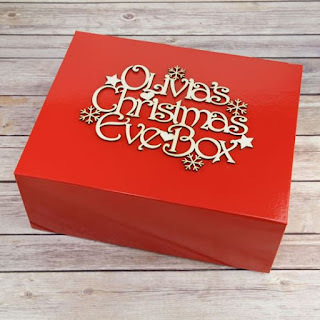 The items could be put into a cardboard box wrapped in Christmas paper or for a more lasting container, the internet is now awash with personalised wooden Christmas Eve boxes which your child can use year after year. 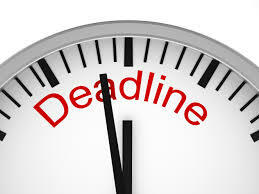 The 2 Week lead time will be for orders placed from the 22nd December until the 13th February for Production/Fit in January & February. As the weather turns, thoughts of open fires, snug interiors and nights in with friends and family are at the forefront of our minds. The Autumnal chill welcomes warming soups, hot drinks and cosy knits. All of these pursuits have been encapsulated perfectly by the Danes in a concept called "Hygge". Hygge hype is this Autumn's focus and it couldn't be more appealing! Pinterest is awash with ideas of how we can rival Denmark in getting our homes and social lives Winter ready and DWS have put together a board that you can access straight from our Home Page on our Pinterest site. 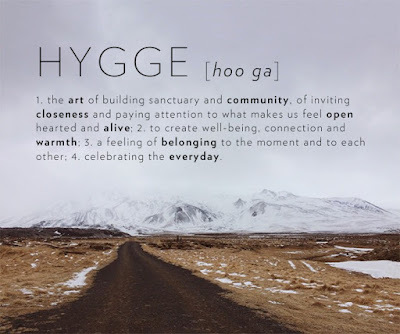 The definition of Hygge (pronounced hoo-gah) is summed up nicely by the 'Visit Denmark' website http://www.visitdenmark.co.uk/en-gb/denmark/culture/art-danish-hygge..."In essence, hygge means creating a nice, warm atmosphere and enjoying the good things in life with good people around you. The warm glow of candlelight is hygge. 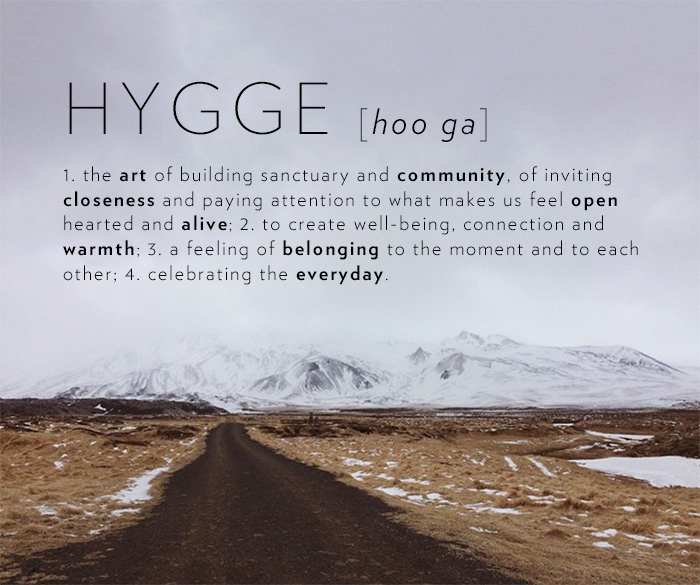 Friends and family – that’s hygge too. And let’s not forget the eating and drinking – preferably sitting around the table for hours on end discussing the big and small things in life. 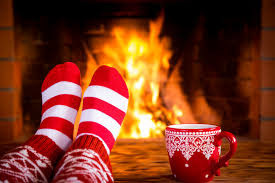 Although Hygge happens all year round in Denmark, it's particularly suited to Winter, with the country having long, dark winters...not unlike Scotland, which makes the art of hygge something we here could fully embrace and make the most of in the run up and throughout the Winter months to come. 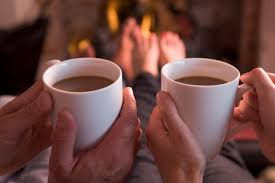 The word hygge originated in the Norwegian language meaning 'well-being' and who doesn't want that to be part of their life? As well as Pinterest there are various books on the subject if you're interested in really buying in to the art of hygge in your home and life. 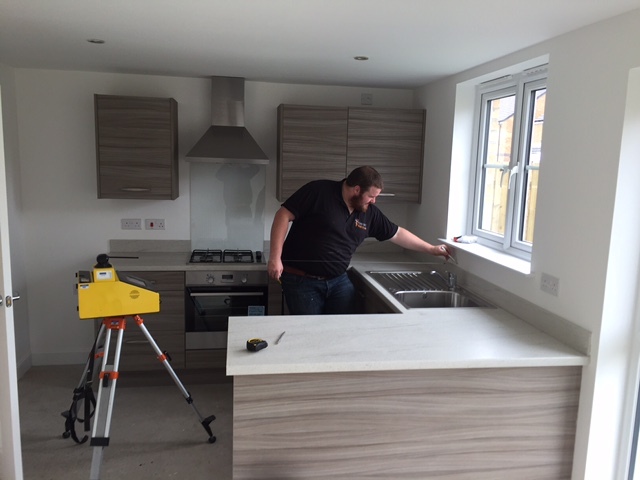 The photos below give a small insight into the installation of Corian worktops. This complex procedure, carried out by only Dupont accredited fitters, achieves the seamless look of the Corian worktops. A truly stunning result! The worktops shown are in Designer White and currently our most popular choice for a contemporary look. Finished product - not a joint in sight! 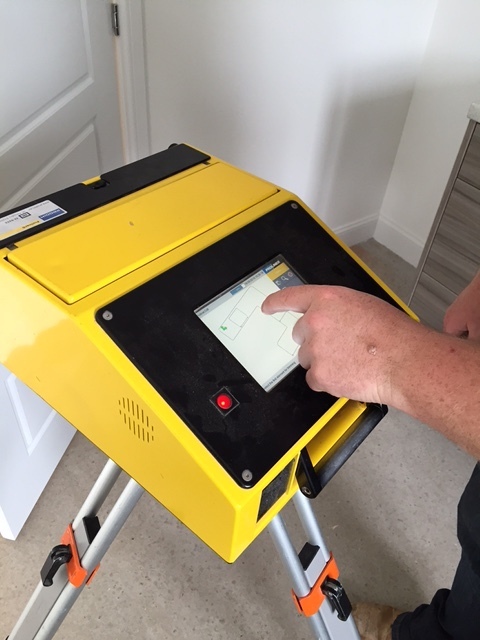 Corian Worktops Laser Templating Procedure - SNAPSHOT! Back in the Summer I mentioned that one of our staff members was installing Corian worktops in their new home and today I have the video to give an insight into the tempting procedure involved to get the precise measurements. Corian is a bespoke product, made to measure and fit your kitchen exactly, with all your desired features added. The templating procedure ensures that when it comes to installation, you have a perfect fit. The above video shows the laser method used by this templater. The other method is to cut an mdf template to the required size and shape. Discount Worktop Store operates throughout the mainland UK, with customers from London to rural villages in Scotland. We work closely with the largest supplier of premium kitchen worktops in Europe, with the most comprehensive range of products manufactured under one roof. Therefore along with our 12 years’ experience in the worktop industry, Discount Worktop Store is able to offer you quality customer service as well as excellent discounts on first-class worktops. Product quality is very important to Discount Worktop Store and through supplying DuPont™ and Apollo® work surfaces we are able to provide the 10 year Manufacturer’s Limited Warranty for both Corian® and Zodiaq® kitchen worktops, and all of our Apollo® kitchen worktops. These are backed by the DuPont™ and the Apollo® Quality Network. We use only approved fabricators giving you, our customer, peace of mind.